The undeniable beauty of an African bronze is given by the accuracy of the signs and by the particularity that only this material, so dense and cold, can give. These sculptures and these representations are unique pieces, which go beyond the obvious decorative purposes, constituting an opportunity to start or complete a collection. Bronze is a material valued in West Africa; being rare and difficult to find, it was commissioned to artists by princes or wealthy persons, who demanded the representation of themselves or of some ancestor. The works were therefore unique and custom-made pieces, made ​​with the technique of lost-wax, with which a minimum amount of bronze was sufficient to forge bronze works of great craftsmanship. In any bronze sculpture, craft and skills are of evident high technical quality, which is the prerogative of the Black art since its appearance. The working technique, in particular the lost wax one, was handed down through the centuries, without considerable variation; thanks to itinerant blacksmiths, the art of bronze met throughout Africa a wide variety of application and expression. Noteworthy are the works of Benin, where the bronze casting depicts different social representations of the kingdom; the sovereign Oba, in fact, made carve in his honor various objects: stools and ceremonial thrones, ceremonial pipes, vessels for food, spoons, combs, fly swatter, neck rest. The sacred factor was emphasized by an accurate artistic execution. The representations of the monarch Oba are among the most beautiful and significant, for example the ones of the king on horseback, dressed with ceremonial clothes. Oba was worshiped as a deity and all the decorations of the palace were dedicated to him. Of exquisite workmanship are the bronze plaques depicting the warriors involved in the protection of Oba; these plaques lined the walls of the vast palace of Benin. In the sacred dynasty of Benin, bronze and ivory were not just materials for court art. They were the symbols with which represent the eternal order, a past that is not going away and that comes back unchanged in the present. These materials so durable, apparently able to escape the passage of time, became the protagonists of court art and cultural rituals, to affirm and celebrate the dynasty’s sacred power. 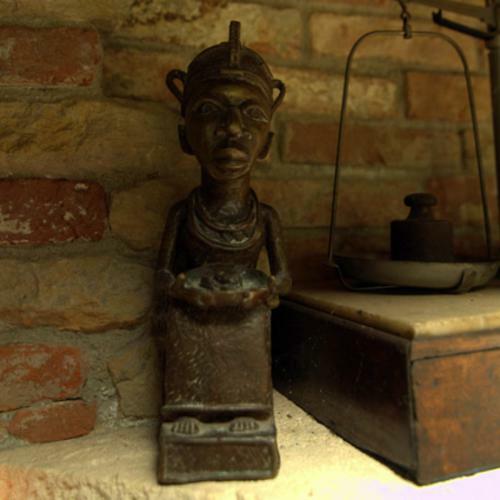 In an environment where even the king’s palaces, made of wood and clay, turned out to be not eternal, bronze and ivory could represent the stability of Benin Empire, which therefore can be described as a bronze and ivory state. The artworks placed on the votive altars for the Oba (that is to say the living king) and other dignitaries, as well as the insignia for their official appearances, were produced for centuries with these materials. Their durability was used to make court art tools, to represent and legitimize the power of the dynasty. In a society without writing, the visual and oral communication became the backbone of the power demonstrations. Only ivory and bronze representations of events, real or mythical, made clear to people the strength and eternality of the sacred dynasty. In Benin Empire, in fact, kings and dignitaries were considered the legitimate holders of power, as direct descendants of the gods. The mythical figures of founders, ancestors or heroes, along with their representations, showed how existing hierarchies derived from an ultramundane will. In addition, in Benin Empire, bronze and ivory’s artworks embodied a dual reality: the past and the present. The depictions of the dead kings were able to connect with the existing authorities and to illustrious ancestors of the past; at the same time, they made clear that the legacy of the ancient continue even in the present, through the action of the Oba. The artworks made of bronze and ivory express the cultural memory of the kingdom. They are able to represent the double dimension that the concept of time had in Benin: that of duration, since the works spoke of glorious eras, and that of cycle, that is the repetition with a regular deadline of rituals and events. The monuments of bronze and ivory, which only increased continuously and accumulated over generations, had the strength to stabilize power. They were durable images placed before one’s eyes, far more effectively than the only oral tradition could do. To maintain order in the Benin Empire, the Oba celebrated cultural rituals which highlighted who had the authority and who decided the health or malaise of the entire kingdom. Although the Oba and his palace represented the core of the force of the kingdom, the highest dignitaries and officials of the royal court in fact administered provinces and parts of the Empire, with broad independence from the central power. Whereas, the Oba was at the center of court ceremonial and ideology, directing and staging, conveying to people the ideas of strength and permanence. Therefore, the materials with which convey this message could only be bronze and ivory.